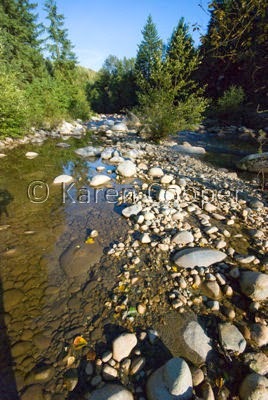 The Coquitlam River is a tributary for the Fraser River in the lower mainland of British Columbia. The whole Coquitlam watershed has a fascinating history. In the late 1800's, an engineering firm called Hermon & Burwell came up with an ingenious scheme to build a tunnel connecting Coquitlam Lake to Buntzen Lake, with the idea of producing hydoelectricity. Now, you have to remember, this is 1898, a wee bit more than 100 years since Ben Franklin was out flying his kite and had his hair raising experience. A pretty big leap of technology for the time. And of course, far thinking people were jockeying to get control of such a huge undertaking and potential money making endeavor. Let's not even talk about how the different levels of government get all involved and twisted up in this. The tunnel took 3 years to build (1902-1905) and is 2.4 miles in length. The men working on the tunnel were paid 25 cents per hour. Fishways were installed to help and preserve the spawning of the salmon that inhabited these waters. Unfortunately, like so many things in life, this never happened and the salmon spawn was devestated. Some have reported recently that the salmon have returned. 93 years later. That's what I love about Mother Nature. She just never gives in or gives up. Today, Coquitlam River is a serene and peaceful waterway gurgling its way through forests and condo developments, with bears regularly patroling her pathways for juicy ripe blackberries. Crows and children spend time along the banks looking for river treasures, and the occaisonal cry of an eagle can be heard far in the distance, searching for the lost way of life that happens when urbanization meets nature. Fantastic blog - stunning pictures! Thanks for sharing! Blessings! Thanks Blessed, hope your day is an awesome one.